Thursday, an interesting day, rushing out in the early afternoon to try catch some fish before the expected rain resulted in a hot humid day instead. With some new flies in the box, i got chance to test one as the water was looking a little colored strangely despite only very light showers 2 days previous. I was trying to use more barbless hooks and my new Hot Head Peasant Tail Nymph was that. with a size 14 on to match the size of the olives in the rocks i worked my way up. Keeping it brief it was a slow start, losing only 3 small trout before i caught my first which was half way round my stretch. Was a funny catch as like the others it slipped the barbless hook when it jumped out but landed on the hook and foul hooked itself. You can probably see the small mark near its front fin. it bled a little but it swam off confidentially. i'll recognise this fish if i catch it again. Nearing the end of the run i lost several more on retrieve, but i managed 2 more trout, nothing special but trout all the same. As i waded to my final run, through a long slow deep section, nothing rises here but i always watch the far side. i turned to check my footing to see, what i first thought was a large pike, a huge trout of easily 10lb compared to internet photos. I was merely 10-15feet away when as i stopped it spotted me and swam into the deep pool opposite. I had mixed emotions, a sickly feeling for not noticing this trout in the shallows as i watched the deeper section, a missed oppurtunity surely, a weird feeling about being in the water with such a large fish, yes i may have caught 27lb pike back in the day but i was never in the water with it. 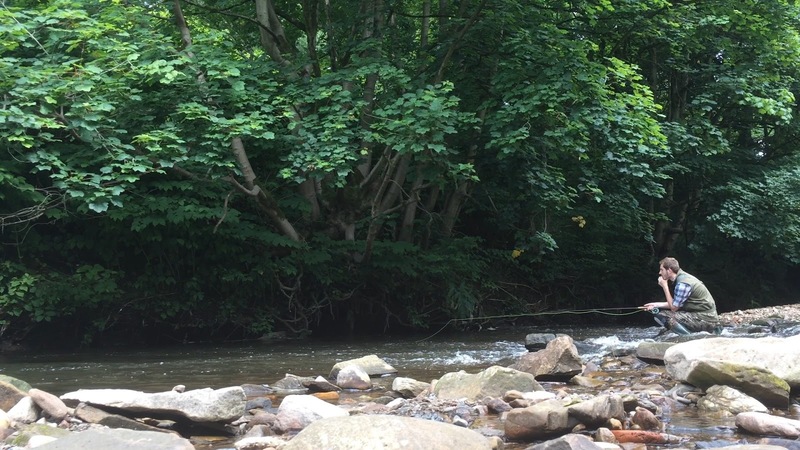 kind of a 'you don't know what else hides down there' and a feeling of excitement, knowing there are large fish (spotted 2 large chub further down stream) in my section is very much exciting but how to tempt them from a slow deep section if the don't rise. i can only presume it was eating the minnows in the shallows as there are always thousands here. i walked home and witnessed a king fisher dive in the shallows, hoped it would do it again but only videoed it landing in the tree in front and looking at me, which i funnily said 'hello' too before it flew off. Friday, a dull overcast and very wet day, it wasn't heavy rain yet but it was 'the fine stuff that wets you through' a employed a new tactic in my nymphing with the use of a foam twist on indicator, which would help me adjust the length of the tippet for each section individually, the first riffle where i know where there are trout but hadn't had a hit there for a while actually produced a fish, however it jumped out the water to grab the nymph strangely and was quickly lost as it bounced down the rocks. I was still using the Hot Head PT as the water was more colored due to the rain. Further up in a run that had only produced one fish, which was a nice fish to be fair, i had another strange take, i saw the trout rise up from the dark and grab the nymph, a quick fight and it was off again. At this point i was questioning whether they had initially seen the indicator and gone for that and took the nymph instead but how would i know what trout think they change there mind every day. Further upstream i lost several more on retrieve, a steady wave of frustration was creeping in, i believed a mixture of barbless hooks and quick reactions meant i was striking to early for the hook to set in to a better section of the mouth.